What can still be learned from a historical intervention in visualisation is how to bypass language with new symbolic tools – an approach once set by social philosopher Otto Neurath and his team under graphic designer Gerd Arntz. Conceived as a lingua franca for the modern world, Isotype (International System Of Typographic Picture Education) was developed in Vienna of the late 1920's. Presented as perhaps the first scientific logo system, Isotype served to visualise social and economic relations especially for the uneducated receiver to ease reception of complex matters. 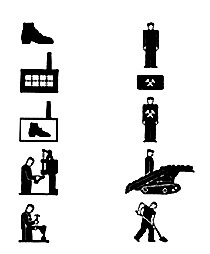 Isotype was developed from a specific socialist concept of adult education enhancing existing scientific arguments with an education through the eye. In well received exhibitions in European cities and printed material data graphics, the visual display of quantitative information served the dissemination of knowledge beyond reading, generally accessible independently from individual educational backgrounds.